I asked him to note it down immediately on a piece of paper and read those lines describing wonderful imagination of his mind [Had to guide him with sequencing of few words]. I felt so proud of him, I mean even at this age I won't be able to express myself in poetic form. Below is the poem for all of you to read [improvised with minimal help]. After I read his poem, I remembered a food creation of mine which I would like to post today. So no recipe here :). The creation is a DOSA served in an unique way based on space theme. 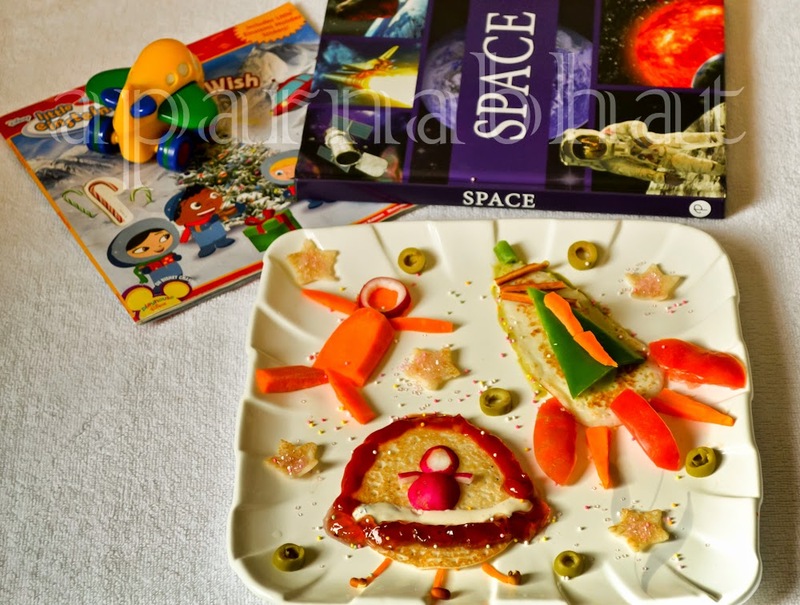 I used normal dosa batter, carrot slices, tomato slices, sliced olives, capsicum, purple radish, pretzels, sprinkles, to prepare this "Dosa from space". You are right, this theme was inspired when I saw 'As' engrossed in that book [seen in the pic above] instead of eating his breakfast. Being a weekend, there was time with me in the morning so thought why not beautify the dosa and serve it to him in a way that would grab his attention. The space book in his hands gave me the idea and I decided to make astronaut, space shuttle, alien, rocket, stars, etc. No prize in guessing what happened next :P. There was a 'tu tu main main' fight between my boys to grab the plate first and finish off everything. I had to prepare one more dosa with similar design and later both of them enjoyed eating it. 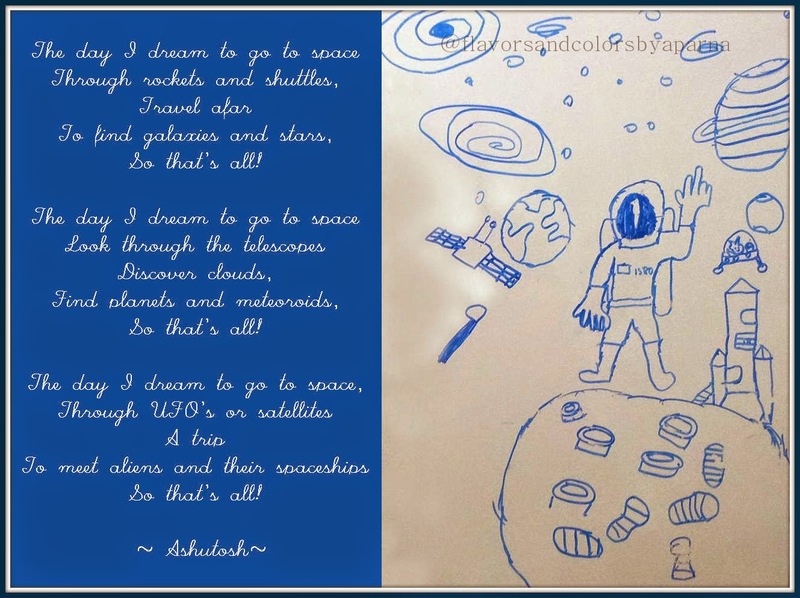 Hope you all liked reading the poem as well as idea shared for designer dosas !